Goal Kickers – Baxter 3, Hancock 2, Manteit 1, Wilkinson 1, Johnson 1. Best Players – Murdoch, Roos, Davis, Manteit, Clark, Baxter, Doran. 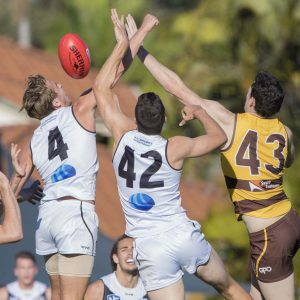 The curse of Graham Road has struck again as Southport fell to the Aspley Hornets on Saturday amid an injury crisis that will test the depth of our playing list. In the closest of NEAFL seasons, we are clinging to top spot by a mere 3.47 percent. With Co-Captain Andrew Boston a late withdrawal from the side, the Sharks started well and kept Aspley goalless during the first term. Rising Star nominee Daniel Charlesworth was unfortunately assisted from the field midway through the term with what looked to be a serious knee injury. He will be scanned this week. Aspley took control in the second quarter as Gavin Gross bombed a goal from 50 on the boundary then Full Forward Jono Freeman kicked three goals for the quarter to set up a handy 21 point half time lead. Coach Steve Daniel unloaded at half time, which obviously inspired Josh Hall who took a massive hanger five minutes in. Three minutes later, defender Rhys Clark limped from the field with an ankle injury that would end his afternoon. We were two men down but still competing hard. Aspley then shut the door with three goals in four minutes to go to the three quarter time break with a 27 point lead. Josh Baxter, playing in his 100th game for the club, battled valiantly kicking three goals in a great solo effort during the final term but some easy misses from some of his team mates during the quarter just took the wind out of our sails. We now head to Darwin Saturday desperate for a win!